We refer to the battle, which was fought on a sector of the same field of battle as Wagram two months later, as the battle of Aspern-Essling. However, it’s known by the Austrians as Aspern and by the French as Essling. The reason for this is that each of the opposing forces claimed some sort of victory and each named the battle after the sector of the battle in which they fared the best. The fact that Marshal Masséna was rewarded for his skill in leading the attacks on the village of Aspern by being honoured as Prince d’Essling speaks volumes. Luckily, Marshal Lannes who did actually lead the attacks on Essling was out of the picture by the time honours were handed out. However, my own reference to Essling refers rather to the sector of the battlefield I decided to concentrate on and begin by wargaming as a battle in itself. 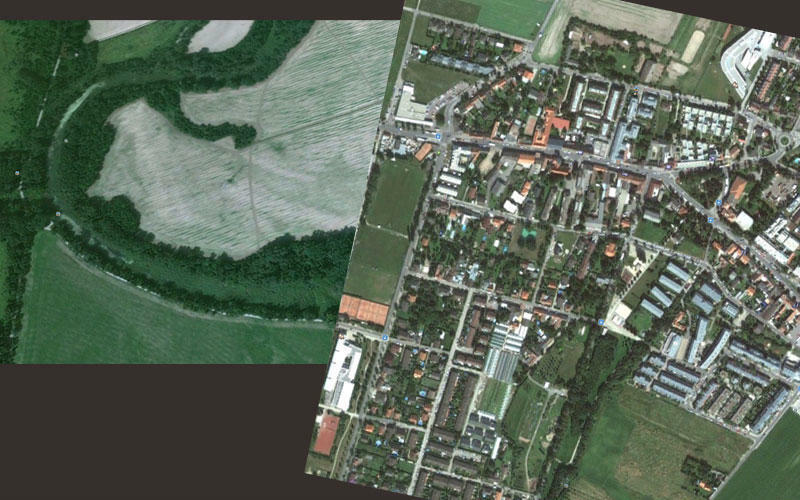 Google Earth is such a fantastic resource for the wargamer and so, of course, I was soon checking out the satellite photography and zooming in on the battle site of Aspern-Essling and then matching it with all the maps I could find. It’s not only amazing how many features are still there today but how accurate the old maps are when compared with the satellite photography. 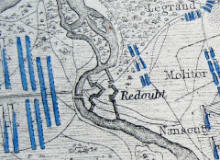 ABOVE The final crossing point and the Mühlau salient where Napoleon spent the night of 21 May in a tent. RIGHT Essling today: the 1809 street plan is still very obvious. © Google Inc. LEFT Map of the same crossing point and the Mühlau salient.